With the surrounding Santa Monica Mountain Range as their inspiration, longtime Topanga property owners chose to shape their hillside property with sustainability in mind. Originally overgrown with weeds and dotted with boulders, the undulating topography inspired us to follow the natural lines of the hillside. We carved two terraces that expand and contract from intimate path to gracious patio. Three sets of curvaceous stairs stitch the terraces together. A simple palette of natural materials ties this vision together. Permeable paving materials, such as flagstone set in sand and decomposed granite encourage water percolation. 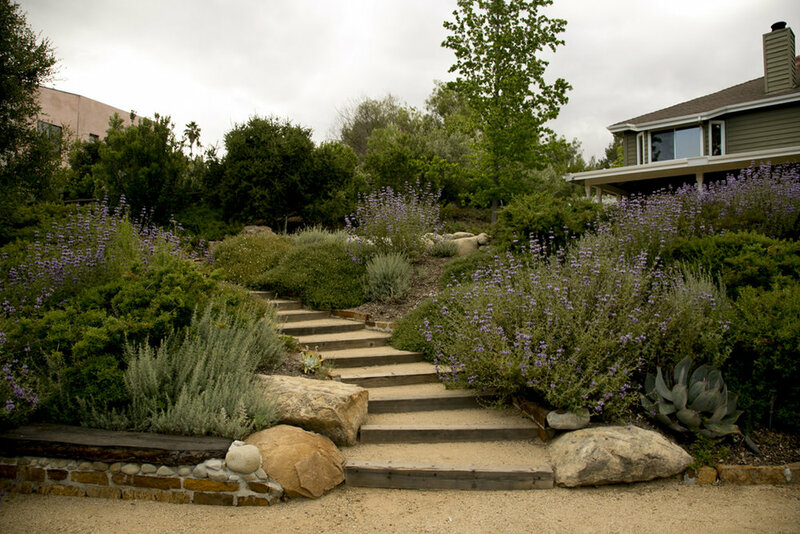 We selected natural stone edging instead of plastic edging and landscape timber steps instead of toxic railroad ties. The featured boulders are sourced directly from the site. While the flagstone and stone edging compliment a rare type of iron stone found on site. While beautiful, the surrounding mountains always remind us to be wary of fire. In response to fire danger, the planting is more manicured near the house and wilder as you move you away. Evergreen shrubs hug the house, including rosemary, westringia and sage-leaf rockrose. While tough California native plants hold down surrounding hillsides, including coyote bush, California lilac, manzanita, & coast live oaks.